Here's the recipe I promised yesterday. Another flavor combination with my browned butter almond shortbread. I can't get enough of these cookies! 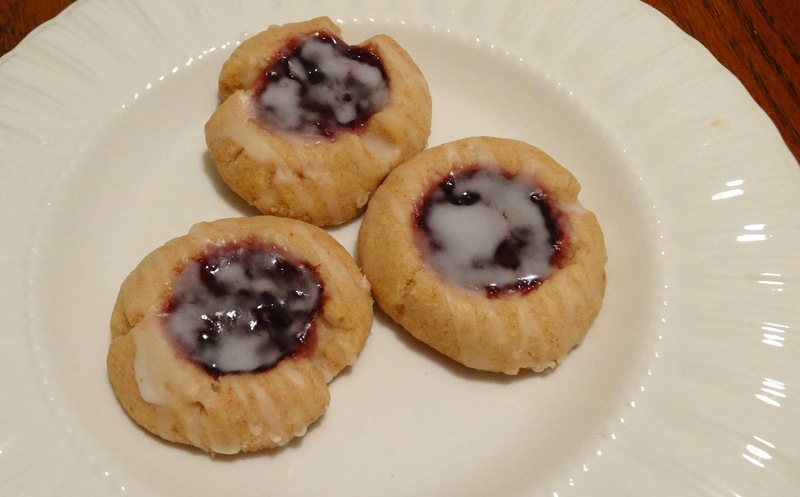 You can try it with any number of different jam flavors, but the boysenberry is my favorite. The almond glaze brings out the almond flavor in the cookies and they just melt in your mouth. Cream together the butter and sugar until light and fluffy. Mix in the vanilla and 1 tsp almond extract, scraping down the sides as necessary. Mix in the flour. Preheat oven to 350 degrees F. Fill each indentation with about 1/2 tsp boysenberry jam. Bake on a parchment lined baking sheet for 12-14 minutes. Allow to cool on baking sheet. Mix the powdered sugar, water, and 1/4 tsp almond extract in a small bowl. Drizzle over cookies and allow to set before devouring.